Freshly married with a young babe, Joe and Leah bought their first home together and had their sights set on making it their own before moving on in. First on the chopping block was a long wall at the top of the stairs that divided the living and space in two. With a large portion of the wall out removed it was time to improve upon the kitchen layout and update the finishes. 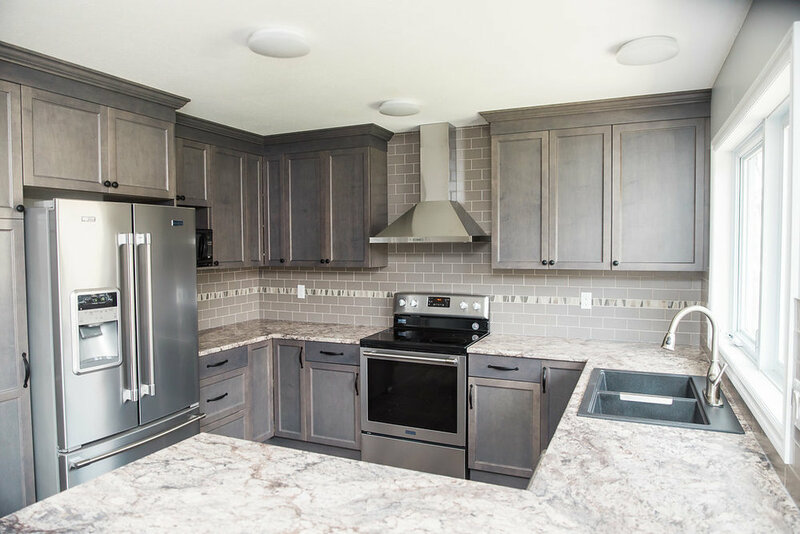 The appliances didn't move around too much but the opening in the U-shape between the range wall cabinets and the peninsula increased which created room for the dishwasher directly beside the sink, more storage and counter space and better workflow. Out with the rusty, clay tile and European style cabinetry and in with a warm, gray-stained maple shaker style cabinet from Lectus Cabinets. 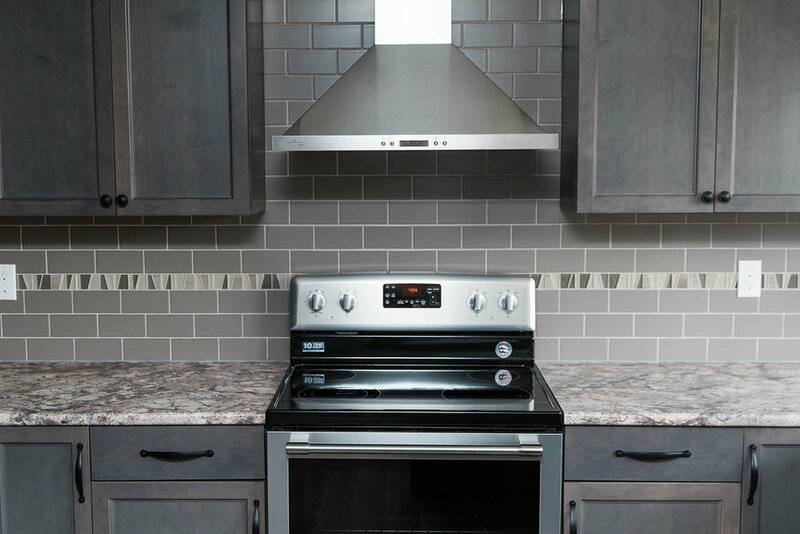 We took the cabinetry to the ceiling for a clean, modern look and followed suit with the tile backsplash around the range hood. We decided to do without a cabinet on the dining side of the window in order to keep the space feeling open and bright. 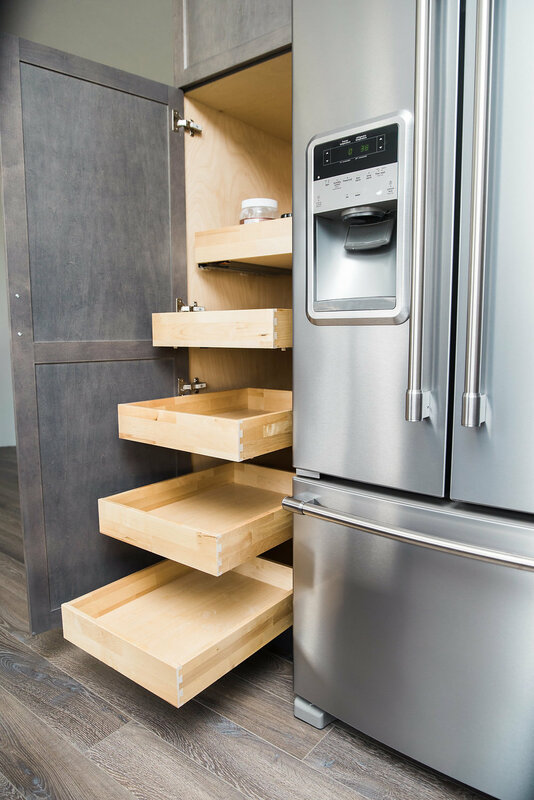 Functional additions to Joe and Leah's already awesome kitchen include: garbage pull-out, a tall pantry complete with 5 rollout shelves, Super Susan corner inserts and a special shelf to keep the microwave up off the cabinet. Tegan designed an aesthetically pleasing and exceedingly functional kitchen for my home. The experience was very positive from start to finish, every detail was carried out in an organized and efficient fashion. She incorporated all of my desires while still maintaining optimal organization of the kitchen space with copious amounts of counter space.